I. Sketches of the progress of education in England, from the reign of King Alfred to that of Queen Victoria. II. Early lives of celebrated British authors, philosophers, and poets, inventors and discoverers, divines, heroes, statesmen and legislators. 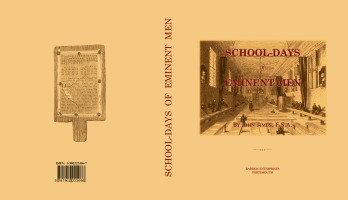 Description: This book contains two sections: the first is an history of education from the reign of King Alfred to that of Queen Victoria, containing sketches on the education of Monarchs and scholars; the foundation of schools including Eton, Harrow, Rugby, Winchester, Westminster, Charterhouse, etc. The second is an account of the early lives of eminent people and how they acquired their learning.